"Rajiv Ji has got a humane passion to help and facilitate 1st time migrants like me to settle down with a job in Oz. " "Connecting with CLA was the best decision I have taken and I am very much proud of myself. " "The career program at CLA is definitely one of its kind. The heart to heart communication style is one of the unique things about working with CLA in addition to many other priceless lessons I learnt from the program. " "One of the best thing I liked about the CLA team is that they bring the best out of a candidate to embrace the success instead of following a set process like other job consultants. " "Jobs are not all about Cover Letter and Resume, it is way beyond that and thank you for giving me that knowledge and helping me to overcome my fears." "The sessions from Rajiv helped a lot to boost the confidence by knowing what are my challenges and my strengths, and how my strengths can overcome the challenges." "It's because of you I am here in Australia creating my future. You were the driving force for me to get out of the comfort zone and put my first step in this world of unknown. Thank you. " "CLA provides mantra to lead a successful life, and all the techniques are tried and tested and if followed religiously one is destined to succeed." "Excellent and exceptional service, value for money. They have vast experience and service offered are best in industry"
"Rajiv has been my mentor since I arrived in Australia 11 years ago. I always had a fear factor to succeed here but with Rajiv"
"I've discovered that eliminating your mental fears and overcoming your limiting beliefs are critical to your job search success." "The methods used to strike out limiting belief actually made me feel that I was literally erasing them from my subconscious mind. The NLP exercise was cherry on top. It took me into a deeper trance and I felt connected to the real power of ME. " "Before working with Rajiv Sir I was very frightened from inside due to the fear of unknown in a new country. I was stressed if my family will be able to adapt to this western culture. Since working with Rajiv Sir and his magical success blueprint this picture has completely changed. I feel very confident, positive, and fearless. The inner strength and inspiration I received from Mr. Rajiv"
"Mr. Rajiv's NLP sessions are thorough, planned and value for money. He is a warm and approachable person who you can discuss everything with in order to progress forward. He is a phenomenal success coach." "I personally endorse and recommend the services provided by Career launch Australia for settling in Australia with a positive outlook." "Getting a job is much more than just your resume and cover letter. It's about connecting with recruiters, interview preparation, managing relationships and earning what you're worth. " Are you a skilled immigrant struggling to find your perfect job in Australia while you're in Australia or overseas? Have you applied for several jobs and getting very few to no interview calls? Have you been interviewed but consistently getting rejection letters (and wondering why)? Are you a resilient professional who is really serious about investing your time and money in quickly finding the job in your usual profession? A study shows that recruiters spend only 6 seconds reviewing an individual resume. Does your resume stand out in 6 seconds? 89% of all recruiters report hiring candidates through LinkedIn. Does your LinkedIn Profile attract interest? On average, every corporate job receives about 250 applications. Does your application hit the nail on the head? 92% of employers or recruiters hire or plan to hire candidates through professional networks or referrals. 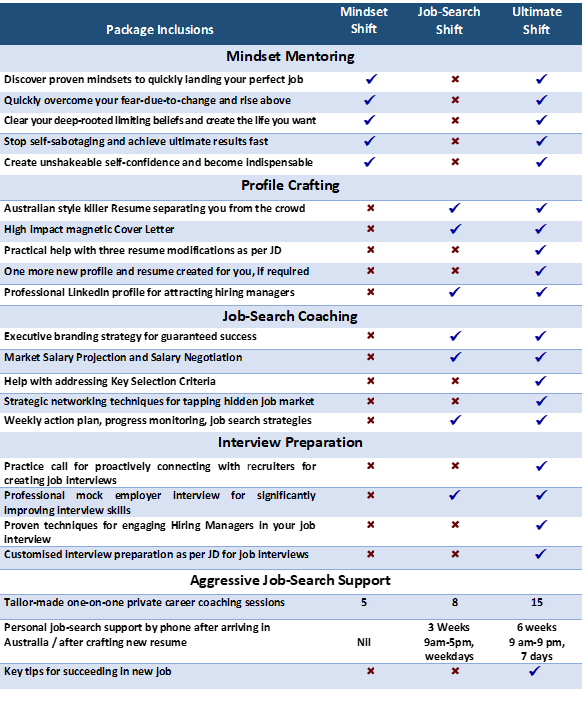 How many recruiters and professionals do you know? 85% of critical jobs are filled via networking of some sort. Do you know how to strategically network with the right people and access the hidden job market? Average Australian monthly full time salary as per Australian Beurau of Statistics is $5000. You're losing this huge amount every month you're jobless for AND you're using your own hard-earned overseas money to survive in Australia. Can you afford to sustain this double loss? Your investment in above mentoring programs will depend on the time we believe we'll need to invest in helping you land your perfect job quickly. We'll be happy to offer you competitive pricing once we've thoroughly discussed your situation in your "Career Launch Session". We are absolutely committed to you achieving great results with our incredible support and our practical mentoring programs will far outweigh your investment. We are confident that you will get results when you follow our guidelines and do the work we ask you to do. These packages have generated amazing results for many immigrants and we believe they can do the same for you.